Recombinant Chicken interleukin-6 (PAP003) detected with horseradish peroxidase conjugated Mouse anti Chicken interleukin-6:HRP (MCA5932P). 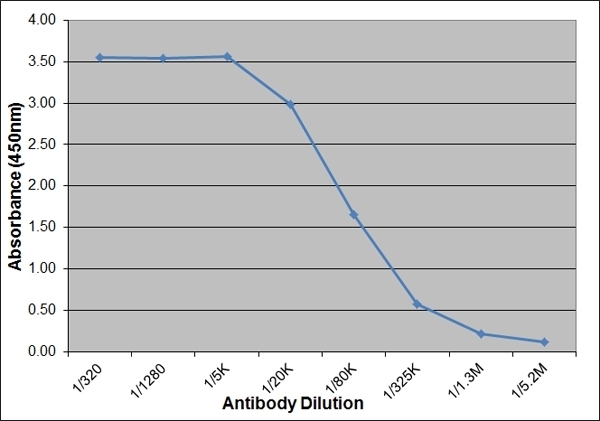 Mouse anti Chicken Interleukin-6 antibody, clone AV129 recognizes chicken interleukin-6 (IL-6), a cytokine that can function in either a pro-inflammatory or in an anti-inflammatory capacity. Chicken interleukin-6 is produced by a range of cell types including macrophages, endothelial cells, T-cells and fibroblasts. IL-6 is a multipotential cytokine with the ability to induce proliferation and differentiation in B-cells and T-cells and acts as an important mediator in acute phase response. This antibody was raised as part of the UK BBSRC funded avian immunology toolbox project and is one of a number reagents now available from Bio-Rad developed from this project.